I may have mentioned I was a co-author in a secret blog throughout 2009, which negatively affected my blogging time over here. Some of you were aware of it, but since it was a Twilight blog, I figured only a select few of my readers would be interested. Hence the not mentioning it publicly here. Plus we were all a bit saucy over there and didn't know how some of you would take it. Well we decided to end the blog on Christmas Eve and split the four of us in half starting two new non-Twilight blogs. Soooooo I've got another secret blog. Except I'm about to flip back the veil of secrecy, tear down the walls and expose it to you. Spank is my best friend and partner in crime. I am Ginger. Together we discuss current events, movies, television, music and celebrities, as well as entertaining pictures and videos. Disclosure: If you choose to visit this blog, you will be entering into my secret life for the past 13 months. You may not like what you see. We brought the saucy sauce over from Twilight-Headed and keep it on hand in large quantities. There is absolutely no educational merit to our blog. We're just here to entertain and have fun. I'm headed over to check it out. 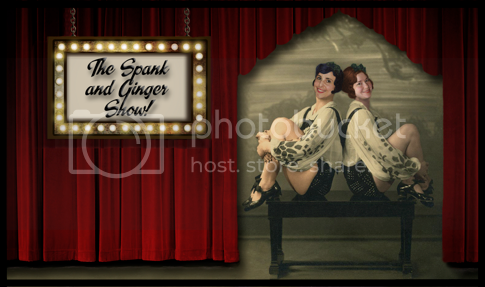 Love both you and Spank, it's a great blog! "There is absolutely no educational merit to our blog." I disagree. I've found it quite informative and enlightening. LOVE the new blog Ginger!